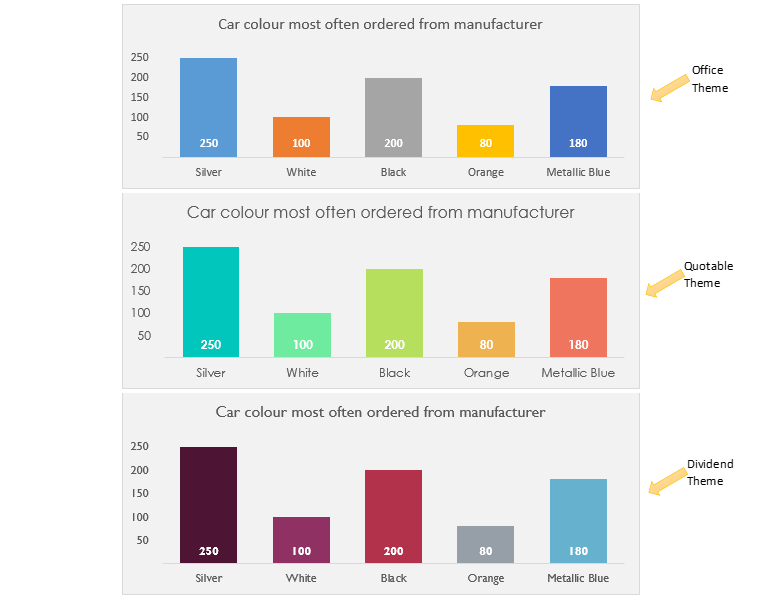 In this article, Taryn (0ur seasoned blogger) has shown how to make Excel graphs/ charts look professional and cool. She has made her charts looks far far better using just 10 Excel charting tips. 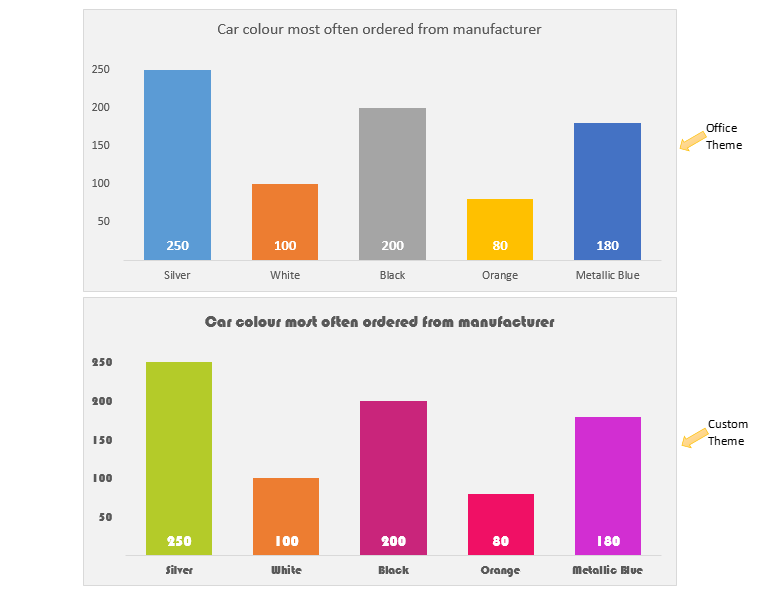 Creating charts and graphs is basically about ensuring effective visual communication and presentation of your data. Excel provides default graph settings, upon creation. However, for business purposes, it’s often necessary to spruce up a few elements of your chart, to ensure that you really wow your clients and/or boss with your amazing charts. In the example below, the first graph has been updated from the default chart Excel provides, which is shown at the bottom. The first title provides better insight into the data, as well as the location/place it is drawn from. 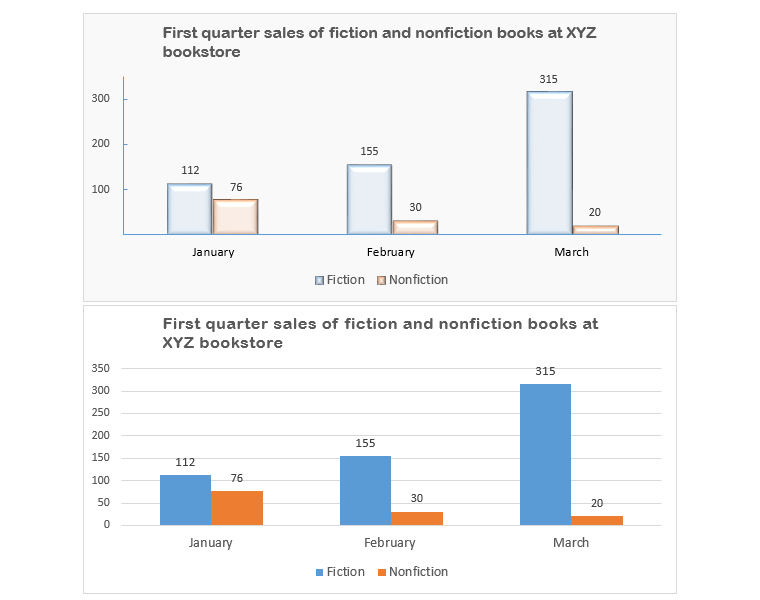 When contemplating titles, try and describe the source data the chart was based on and don’t forget to add the location/company or another place of reference if that information is available. A chart title is supposed to orientate the user and not leave the user trying to guess about who, what or where? Remember a chart is not supposed to be a puzzle. Gridlines are a common source of clutter. In the example below, the chart at the top has all the gridlines removed. The chart at the bottom has gridlines, which are not conveying any meaningful information. The data labels are already providing the numbers. In order to remove the gridlines, select one of them, but not the top one, though, then press delete. The other problem with the chart at the bottom is the vertical axis is cluttered and contains too many numbers that are not necessary. We can fix this by selecting the vertical axis by clicking on it. Right-click the axis once it’s selected and choose the Format Axis option. Expand the Axis Options section and change the major unit to 100, for the example below, and the minor unit to 20. Then expand the Tick Marks section and make sure for Major Type, Inside is selected. Another thing to consider about the vertical axis is that sometimes Excel sets the maximum, way beyond the actual data points. If this has happened to your chart, do not fear. Simply select the vertical axis then right-click and choose Format Axis. In the Format Axis panel, under Axis options, Bounds, set the maximum to a lower value. The chart at the bottom also contains an unnecessary zero. In the first chart, we removed this by again right-clicking the vertical axis, selecting Format Axis, in the Axis options section, expanding the Number section, in the Category section, we chose Custom, for format code type #” “, to clear the zero. 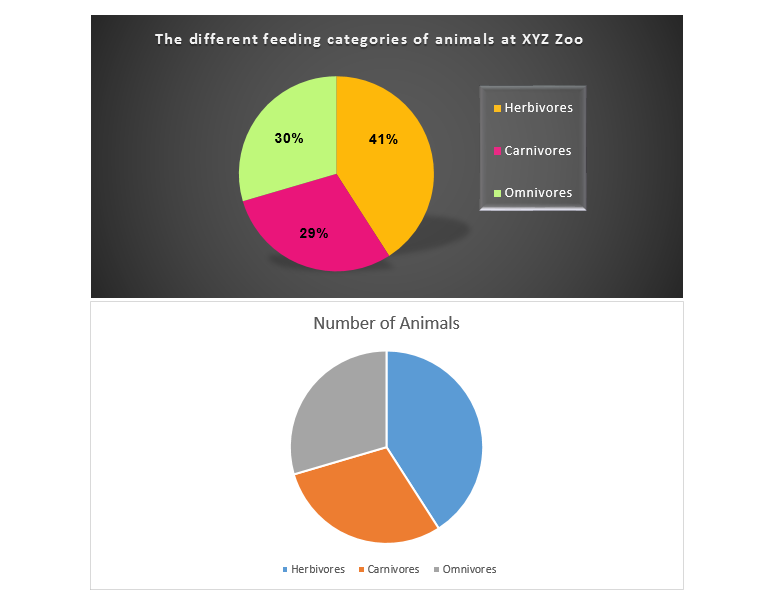 For example, if you are creating a pie chart, there are a finite amount of slices that the pie chart can accommodate. 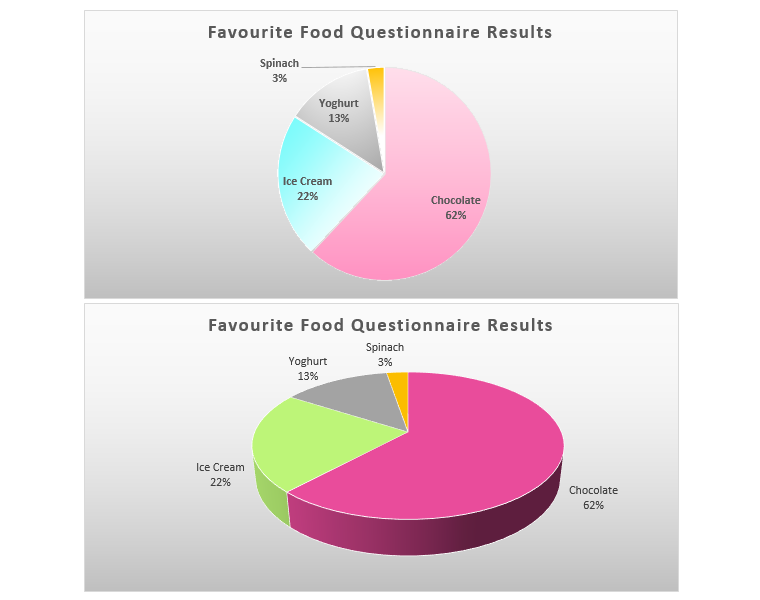 If you have more than 4 categories rather use a pie of pie chart or a bar chart. In the example below, in the second chart, there are too many slices, and as a result what the chart is supposed to be representing is unclear. The first chart uses a pie of pie chart to represent the data instead and as such it’s a better fit and more clear. So always make sure your data and your graph match and you have chosen the right graph for your data. If you have multiple charts on the same worksheet, make sure they all have a consistent look and feel. A way to achieve this is by using Chart Templates. Once you have formatted the chart according to your preferences, right-click the chart and click Save as a Template. You can then apply this template to other charts as needed. In the future, when you will have a chart, you might want to format the new chart according to the saved template. To do that, simply right-click the newly created chart (where you want to apply the already saved template) and select Change Chart Type, then navigate to the Templates folder, choose one of the templates, you previously created and click OK. In the example below, the charts in the first sheet have a professional streamlined, consistent look. 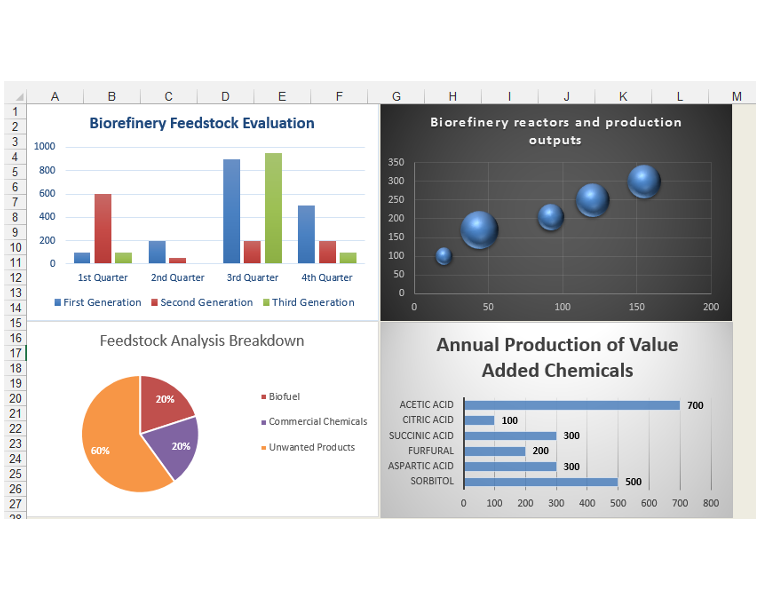 This spreadsheet can be used as a dashboard, whereas in the other sheet at the bottom, the charts look messy, disorganized and disjointed because of the lack of consistency. 3D charts often give an incorrect perception of the data. Compare the two pie charts below. 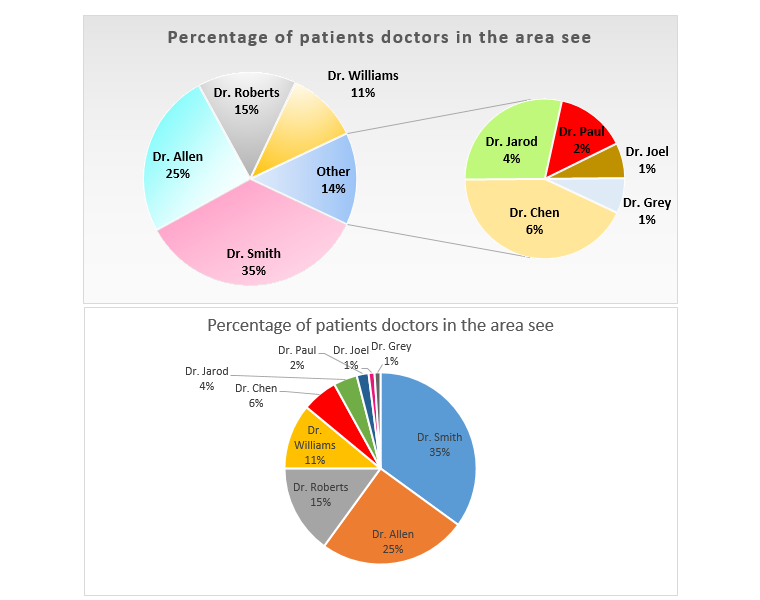 The first chart shows the slices of the pie chart in their relative proportions, the 3D pie chart contains ambiguity with respect to the relative proportions. Use the built-in themes Excel has provided to quickly give your chart a new look. 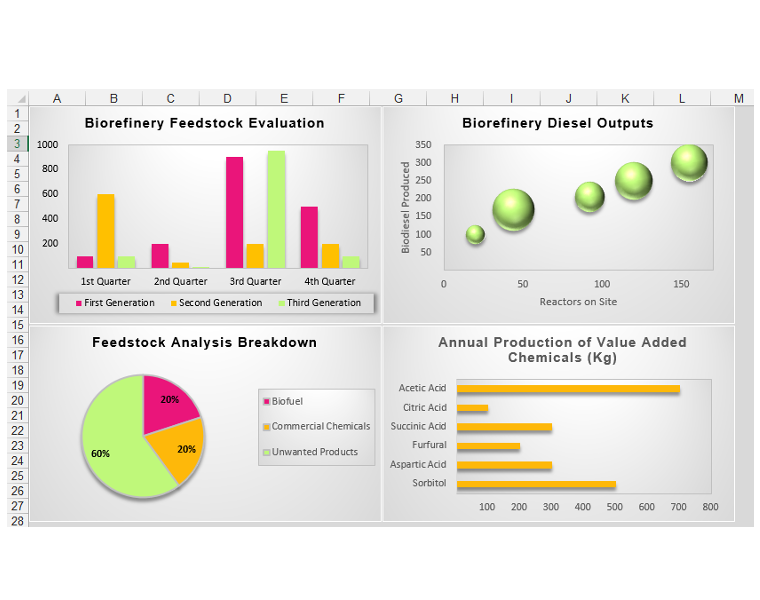 Excel has built-in themes, which allow one to change the fonts, and colors associated with the chart at hand. In order to change the theme of the workbook, and thus change the colors, fonts and/or effects associated with the chart as well. Firstly, go to Page Layout, in the Themes group, click on the drop-down arrow for Themes and select a theme, to see the chart update its colors and fonts. The charts below, all use the same source data but are formatted using different themes. The first chart below uses the default Office theme, the second chart uses the Quotable theme and the third chart uses the Dividend theme. Customize and create your own theme, if you need a unique look or to incorporate your own branding. You can create a new theme by picking your own colors, fonts, and effects and then saving this as a new Custom theme. Go to Page Layout, Colours, Customize colors and choose a new set of colors, a new set of fonts and effects, then click on the drop down arrow in Themes to save this as a new custom theme. In the example below the same source data is used to create both charts. The chart above has the standard Office theme applied, whereas the chart below has a custom made theme applied. Don’t get confused between a line chart and a scatter graph. This is a mistake that many people often make. In the line chart, the vertical axis is a value axis and the horizontal axis is a category axis. The points on the horizontal axis are equidistant. An example of equidistant points on the horizontal axis can be years or equally spaced quarters. The scatter chart displays values on the vertical axis and the horizontal axis. Depending on the original source data, these points on the horizontal axis can be distributed equally or unequally. A scatter graph illustrates patterns and showcases trends. A scatter graph is often used to demonstrate the relationship between two variables. 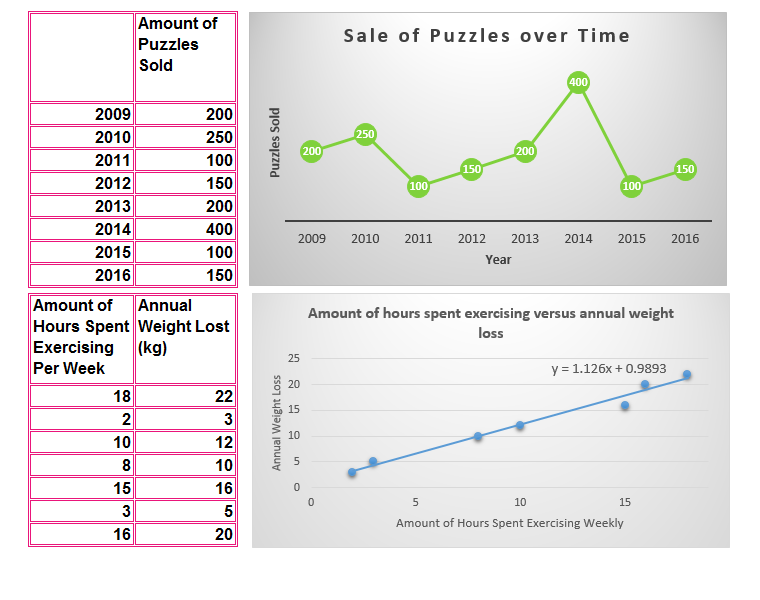 In the charts below, the first chart is a line chart that basically just shows the number of puzzles sold per year. 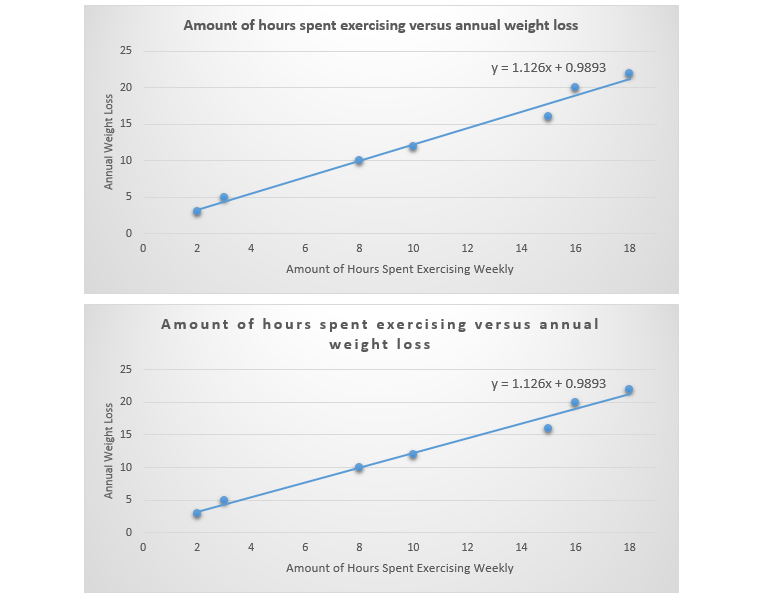 The scatter graph at the bottom shows the relationship between the number of hours spent per week exercising and the total annual weight loss of participants in a study. From the chart, we can see that there is a relationship between the two variables and that as hours spent in exercise increase, so too does the annual weight loss. Individual words in chart titles that are too close together. The way to resolve this is to select the chart title. On the Home tab, in the Fonts group, click on the arrow to launch the Font dialog box, and change character spacing from Normal to Expanded, and change the points to 2. This eliminates the “squashed” chart title look as shown in the top chart. The bottom chart has the expanded character spacing. Now you have an animation sequence involving individual chart elements. Excel graphs are an important part of showcasing data visually. If you follow these tips, you are sure to create really eye-catching charts and graphs, while still maintaining the correct data analysis component and integrity. Please feel free to comment and tell us your tips for enhancing charts in Excel, and any crossover tips when copying charts to other Office applications. What is an Excel Chart? How to Make a Single Line Graph in Excel – [The Easy Way]! 1. How do you clear the unnecessary zero on the vertical axis of a chart? 2. Should you use 3D charts often to showcase data? 3. When should you use a pie of pie chart?